Da Dong Jinbao Jie branch (大董金宝街店), the latest eatery of the popular restaurant, takes the brand name up a level, both in terms of the food and dcor. It showcases its culinary expertise with Peking roast duck, molecular gastronomy, and other beautifully presented Chinese dishes. Many people believe that the best dish Da Dong makes is braised sea cucumber. 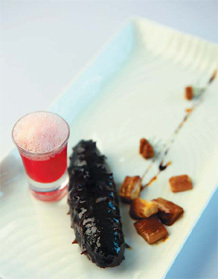 Sea cucumber has long been important in Shandong cuisine. It is rich in protein and minerals, low in fat, and is considered to replenish the "yin" factor of the body. It has a fragrant flavor, a mixture of roast spring onion and soybean sauce, and has a gelatinous texture. Unfortunately, the sea cucumber is an example of what many expats consider "adventurous" Chinese food, maybe because of its strange look. At a recent tasting we asked Da Dong whether his expat guests order a lot of sea cucumber. He said he had seen Spanish people eat it, but others didn't seem to be too keen. As such he recommended other signature dishes, such as lobster with Beijing noodles and fried soybean sauce (龙虾炸酱面), and superlean Peking roast duck (大董烤鸭). The Jinbao Jie eatery does have plenty of great dishes to try. Lobster soup "cross bridge" Canadian geoduck clam (龙虾汤过桥加蚌) is a Yunnan-style soup. Low heat beefsteak with goose liver sauce (鹅肝汁低温牛肉) is a molecular gastronomy dish, slow cooked at 60 C, and super tender. Grilled matsutake mushrooms with tomato beer (焗扒松茸配番茄啤酒) combines the rare fungus with tomato to create a liquid resembling beer. All dishes are presently beautifully and even look like paintings on the dish. The lighting and interior decor creates an artistic and surreal atmosphere and the ancient Chinese poems on the wall are a great effect. The average bill is 300 yuan per person, excluding wine.